Most of us can recall (vividly) key childhood traumas that marked us, shaped us, and that (occasionally) return in the deep dark of the night to haunt us: The death of a pet; the unwanted attentions of school bullies; the flying monkeys from Wizard of Oz etc. For me, however, the key moment when the child gave way to the man (or at least the older child) was the 19th of July, 1986, when 8 members of a fictional football team lost their lives to a suicide bomber in the (equally fictional) Middle-Eastern state of Basran. 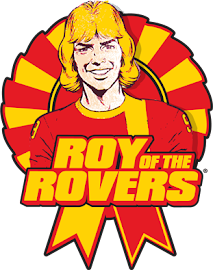 I remember well being on summer holidays in Castlegregory, Co. Kerry and waiting (very impatiently) for my father to arrive down from Limerick with the relevant issue of Roy of the Rovers (RotR) in hand. The front cover hinted at a major (and terminal) clear-out of the Melchester Rovers old guard and thus it proved – with the core of that great team breathing its last on Basranian soil. I make no apologies for the tears that flowed in our mobile home that night – for though comic book deaths often have a way of being less than permanent, these characters inhabited a 'real world' (of sorts) and possessed no super powers (with the possible exception of Roy's devastating left foot). It was, therefore, clear to me, as I lay (distressed) in my bunk, that for these fallen sporting titans, death was emphatically a one-way street (the undiscover'd country from whose bourn no traveller returns). 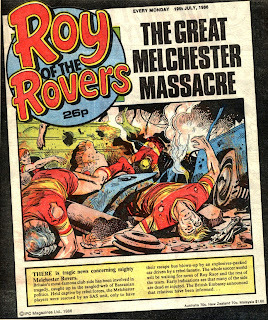 The startling boldness of this move represented, perhaps, the zenith of RotR's addictive, soap-opera style, which (at its best) featured dramatic highs and lows as a matter of course: Melchester would triumphantly win the league, and then (a season later) find themselves relegated; Roy would be footballer of the year, and later have his marriage fall apart (or find himself shot!). The topsy-turvy quality of the comic during its 'golden years' captured, all too well, the mixture of manic joy and anguished pain that are part and parcel of your average football supporter's life. Sadly, this particular piece of shocking melodrama signalled the beginning of the end of RotR's glory days – with a gradual decline setting in, as the elegance and fluidity of David Sque's penmanship, gave way to Michael White's muscular and rather charmless style (out with the old, and in with the…not as good). It was not long after the Basranian 'tragedy', of course, that the whole British comics industry suffered a similarly disastrous implosion, with almost complete collapse arriving in the mid-1990s (a decade rightly unloved by comic book fans). Aside from the entertaining (though sometimes traumatic), roller-coaster theatrics of RotR, a couple of other notable, and amusing, features bear mentioning. 1) The tricky issue of ensuring easy communication between the 11 characters on the pitch and the 40,000 characters in the crowd was solved by a simple (albeit wildly improbable) device: regardless of where a supporter was sitting, he/she could both hear the conversations of everyone else in the stadium, and (more importantly) have their every casual utterance heard down on the field by Roy. Thus, comments like the following (from Roy) became the norm: "The fans are right Blackie…we just aren't moving the ball around as fluidly as usual". 2) Key moments in the games would be rendered in a kind of slowed-down, Matrix-esque, 'bullet time'…giving the fans ample opportunity to converse (sometimes articulately, and at great length) about what was about to happen in the next panel. Roy receives the ball on the edge of the box. Cue speech bubbles popping up all round the ground. Person A: The defenders are backing off you Racey! Have a shot! Person B: No, I don’t think Roy should shoot. Spread it wide to Noel Baxter instead, Racey! Person C: Hmmm…I tend to agree with you. Roy should indeed knock it out to Baxter. A good cross in from the right could find Carl Hunt, who I can currently see haring in from the left wing. 3) The RotR writers never clearly sorted out the dilemma of how much contact with the 'real world' Roy and co. should have. In this, of course, RotR was not much different from any number of comic strips one could mention, but the ambiguous line that the strip took on this front led to any number of moments that, a) sat uneasily with my youthful mind, and, b) required some elaborate/farcical sleight of hand from the writers (with Roy's numerous 'unlucky' omissions from the English national team being a case in point). 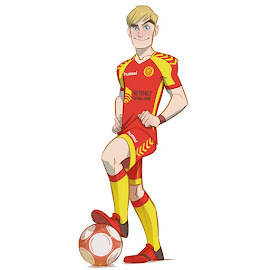 From the moment I started reading RotR, I was (like most children I'd imagine) happy to accept that Melchester Rovers did not, in fact, exist in the world I called home. As a devoted football fan, I had a fairly clear idea of which teams were, and were not, part of the English first division…and it was pretty notable that the Rovers, Walford, Melboro etc., were always absent from Match of the Day (at a time when they were keenly fighting it out for the title in 'comic land'). Despite this willingness on my part to draw a line between fantasy and reality, 'real life' football personalities frequently crossed over into the RotR universe. From Alf Ramsey and Bobby Robson, to Bob Wilson and Emyln Hughes, and on to surreal signings like Spandau Ballet's Steve and Martin Kemp (no, really!) – such inclusions served only to detract from the imaginative suspension of disbelief we readers were happy to make. Even more incongruous were the regular photographs (in the comic's 'factual' section) of 'flesh and blood' footballers with a proud arm around Roy's shoulders. By 'Roy', of course, I mean a wholly unconvincing cardboard cut-out of Roy staring vacantly at the camera beside a grinning Ian Rush (or whoever). While the 'real life' characters who sporadically appeared in the strip were (at least) rendered in pencil and ink, these bizarre photo shoots mashed 2 and 3 dimensional worlds together in a particularly head-spinning way! I mean, I may have only been a young fella, but I was savvy enough to know the difference between a living, breathing, human being and…em…a drawing! Ah yes, happy memories. Sadly, like a lot of British comics, RotR bit the dust in march 1993 (the final issue bore a black cover), though brief resuscitations have occurred since then. A 19 issue monthly publication, and a stint in the Match of the Day magazine ensured that RotR existed, in some form, until 2001 by which time Roy had lost his trusty left foot in a helicopter crash (! ), while his son, Roy Jr., had become the team's new talisman. With that, the curtain, it seems, has come down permanently on the world of RotR…with a dramatic change in the comics industry needed for any possible future revivals.